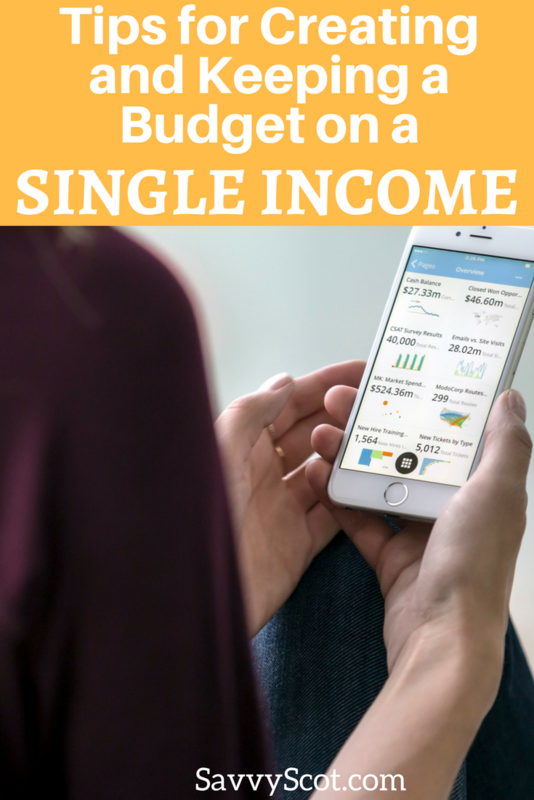 Whether it’s a temporary situation, or a long term position, budgeting on a single income can be tricky. Here are some hints and tips to make it easier. Before you begin, keep a spending log of all purchases and expenses for the previous month. Using this list, sit down with your spouse and discuss the log. Are there discrepancies? What are some areas you both agree need work? What are some areas where you may want to increase your spending? What are you hoping to achieve? It’s good to get an idea of where you are both coming from and what you want to achieve. This will help determine not only your goals but your spending habits and see where cutting any bad money habits may be appropriate. With your spouse, agree on which categories will be included in the budget. This is another opportunity to decide what is important and what may need to go. Once you have your categories, gather up all of your bills and take note of the due dates. Paying bills when the money is available instead of the next pay cycle will help avoid any late fees or surprises. When dealing with a single income, it may be best to house all of the money in a joint checking account. This way, each person has full access to the account and can give gentle reminders to the other if needed. With two people dealing with one source, communication is important. Having a joint account also aids in communication. Communicate about purchases made, any money that is expected to be taken out, and plans for additional funds. Make saving a priority. Nobody wants to think about suddenly being unemployed with no income coming in. Having a cushion provides security in the event that the income stops. The ideal is to start with 1 month of expenses and work your way up to six months. Find out how you can make saving money easy. Learn how to be self-sufficient. Planting a garden, or even bartering can help reduce costs, making what money is available go further. Cutting coupons can be tedious and beneficial. They can also wreak havoc on your budget if not used wisely. Only use coupons that actually save you money. Purchasing something just because you have a coupon doesn’t save you money if you didn’t already plan on purchasing that anyway. Keep in mind that some store brands are priced better even without a coupon. Downsizing isn’t for everybody, but if you suddenly find yourself with one income and more bills than you can manage, downsizing could be beneficial. If you aren’t ready to leave the house you have made a home, think about downsizing the cars. Fun shouldn’t be cut out of the budget. There are so many free activities that families can do together. The key is thinking in terms of time and not money. A couple of times a month, plan meals that you can double up on. It’s typically cheaper buying extra ingredients for one recipe than having to buy different ingredients to complete two meals. Store the extras in the freezer, or eat throughout the week.